For large multinational companies and enterprises, issues in creating high-quality content and interactive media are rare. But for the small business entrepreneur, it’s a different story. I spoke recently with Josh Koppel, the founder of Scrollmotion, about this very disconnect between small and large business capabilities and how his company’s iPad app is trying to level the playing field. Once the app began to pick up speed with enterprises, Apple took notice and suggested that Koppel and his team make the switch to small business. And so they did. Want to hear more about the inspiration for the Ingage app and what small business owners like yourself have been able to do with it? Listen to the full interview here. Scrollmotion has also created a number of templated actions within the app to make it even easier for small businesses to create interactive content. They can create before-and-after visuals. They can turn video into a clickable and movable medium. They can annotate images with points of interest. Koppel has seen what the multinational corporation was doing with the app and has integrated that same type of functionality within Ingage so small business owners can take advantage of it. “You don’t have to be a coder or design to make amazing stuff anymore,” he said. Tell your #brands story easier. See how @Scrollmotion is helping with their new #app. 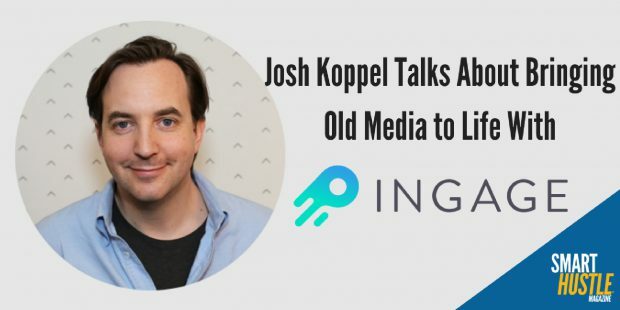 According to Koppel, the Ingage app works really well for anyone who wants to tell an engaging story to their customers in a highly interactive and visual format. He suggests that people who work in real estate, those with large product catalogs, anyone who gives presentations and pitches often, and even people who sell services (like makeup artists) should have this handy app on their side. As he explained, your goal is to stand shoulder-to-shoulder with your prospective customer, selling them on what you do. The second they take that iPad out of your hands because they’re so enraptured with the content on the screen and the story you’re telling them, you’ve won.